We are extremely excited to welcome seven students from De Tandem School in Belgium for two weeks work experience here in Newbury. Sue Stacey our Contracts and Work-Related Learning Manager said, “We are delighted to welcome the students who’ve all shown great dedication to get selected for this amazing opportunity. They all had to apply and be interviewed by a panel back at school, and then complete an application form and have a Skype interview with us in the UK, so we were able to source the best experience for them. “They really have worked hard, all speak amazing English, and I know they will make the most of this experience. We would like to say a huge thank you to the businesses who have agreed to host the students in their work places and give them this invaluable experience of the working world. 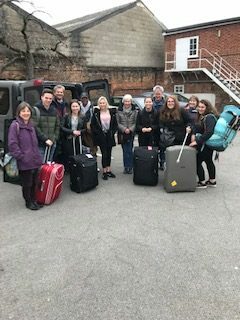 It’s been a real pleasure working with the team at Newbury Twin Town Association who arranged for the students to stay with local hosts. “We manage all aspects of the placement process, making it very simple for any business, of any size, as well as working closely with students to understand their interests matching them with a suitable placement.